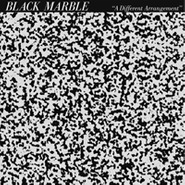 It’s safe to say that if you like minimal/dark wave, you’re going to like Black Marble. The Brooklyn duo’s debut record hits all the right spots — deeply intoned vocals, notable for their smoothness and fullness here, over tinny drum machines and analog synth delights. “Cruel Summer,” the album’s opener, is a fine example of how much energy they can build through carefully layering their minimalistic set-up. It’s sort of a perfect summer comedown for this first week where it truly feels like fall. “MSQ No Extra” sounds like a takeout food order instruction, but its pulse and Cure-style bassline serve as guides through a spectral synth grid that makes the whole thing feel like a seemingly endless city night. The duo doesn’t add much to pretty well-worn territory — everything’s pretty on-the-nose, right down to ’80s-sounding song titles like “A Great Design” and “A Different Arrangement” — but as far as modern bands go who re-create a then-overlooked and now much-beloved sound, Black Marble is as good as it gets.